Watercress really is a superfood. It’s highly nutritious, It strengthens the immune system, improves mental health and helps fight depression. It also have a unique type of phytochemical called nasturin which may inhibit the growth of cancer cells. And if that was not enough it also helps in the production of breast milk. Brimming with the B vitamins C, E ,carotene as well as calcium, fibre, iron and copper it’s also super delicious. I make the above soup at least once a week, is amazingly easy and quick and so incredible full of goodness. And if you’re looking to lose a bit of midriff lard, this is the perfect soup for lunch or dinner, maybe with a boiled egg. It will keep you feeling full for a long, long time. I make mine with ginger, garlic and fresh turmeric. 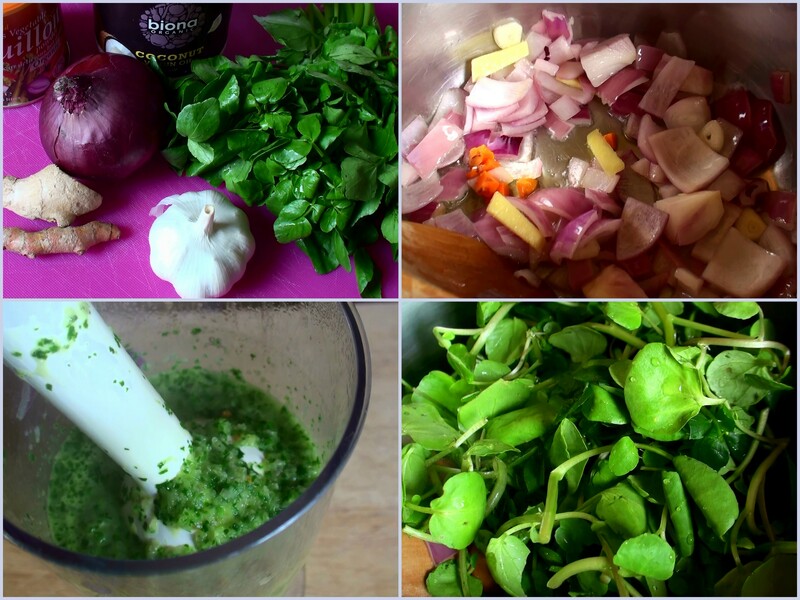 3 ingredients that in themselves are superfoods! 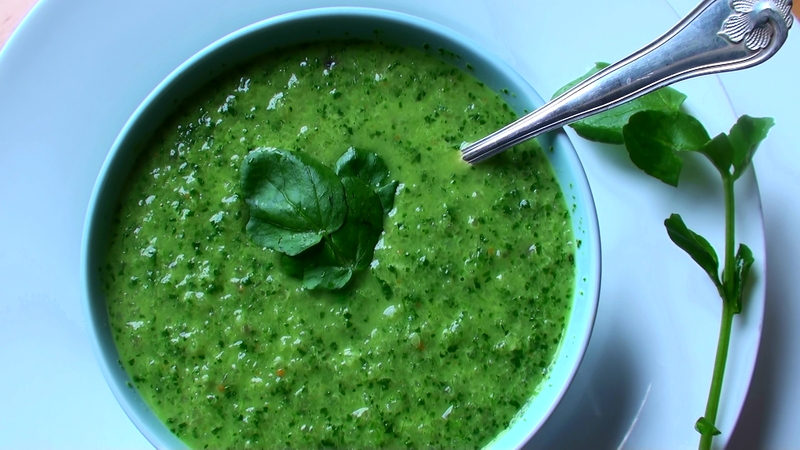 You Need: 1 bunch of watercress,1 cup of hot water, coconut oil, 1 red onion, 2 garlic cloves, 1/2 cm of ginger, 1/2 cm of fresh turmeric, 1/2 tablespoon stock powder, black pepper. 1. Heat up coconut oil In a pan, add a chopped red union. 3. Pour over 1 cup of hot water, mix with stock powder. 4. Blend it, I use a handblender. I never let the soup boil so I don’t destroy any of the goodness Serve. This looks so good and so easy to make. I will make sure to pick up some watercress in the next shop and let you know how I get on.Yum. I like watercress in salads but had no idea it could also be cooked up. I’m assuming it doeasn’t go bitter or anything?